While breast milk is the ideal food for infants, not all moms are able to nurse their babies and must feed their babies infant formula. 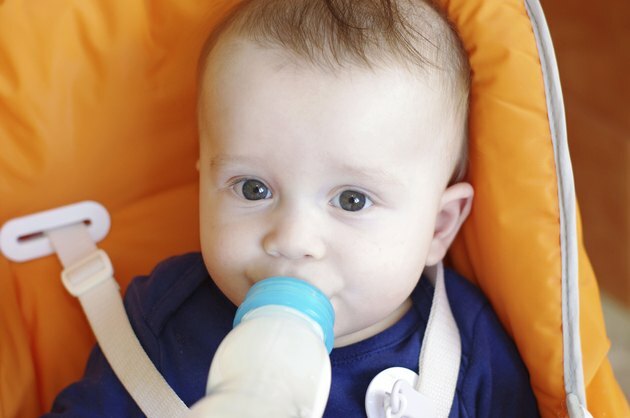 In many cases, infant formula is a major source of nutrition during the first 12 months of an infant's life, and it's therefore required to meet specific standards set by the U.S. Food and Drug Administration. Similac and Enfamil are two types of infant formula. Knowing the similarities and differences between these two formula brands may help you decide which is a better fit for you and your baby. When prepared according to instructions, both Similac Advance and Enfamil Infant -- the two standard infant formulas made by Similac and Enfamil -- contain the same number of calories, which is 20 calories per ounce. The carbs, protein and fat content of both formulas are very similar, but the Enfamil Infant is slightly lower in fat and higher in carbs than Similac Advance. A 100-calorie portion of Similac Advance contains 10.7 grams of carbs, 2.1 grams of protein and 5.6 grams of fat, while Enfamil Infant contains 11.2 grams of carbs, 2.1 grams of protein and 5.3 grams of fat. Both formulas fall well within the range of standard requirements for protein and fat as set by the FDA. A number of differences exist in vitamin content between the two formulas. Enfamil Infant is a better source of vitamins B12, C, E and K, pantothenic acid, folic acid, choline and inositol, while Similac Advance is higher in vitamin D, riboflavin, thiamin, niacin and biotin. Both formulas contain the same amount of vitamin A, which is an essential nutrient that infants need for normal growth and development. The mineral content of both formulas also varies. Enfamil Infant formula contains higher amounts of phosphorus, magnesium, zinc, iodine and selenium, while Similac Advance is a better source of copper. Both formulas contain the same amount of iron and calcium. Iron intake is essential for cognitive and psychomotor development, and adequate amounts of calcium support the infant's rapidly growing bones. Both brands of infant formula contain additional nutrients to help support baby's growth and development. DHA, which is an omega-3 fatty acid needed to support infant brain development, is found in both Similac and Enfamil. Prebiotics, which may help promote growth of the baby's friendly gut bacteria, are also present in both formulas. Some evidence exists that prebiotics in infant formula may help prevent eczema, according to a review article published in 2013 in "The Cochrane Database of Systematic Reviews," but more research is necessary before formal recommendations are made.